We are still working through the "low hanging fruit" category of the book - things that are easy to source, with tastes we are familiar with, and techniques we've used before, sort of. 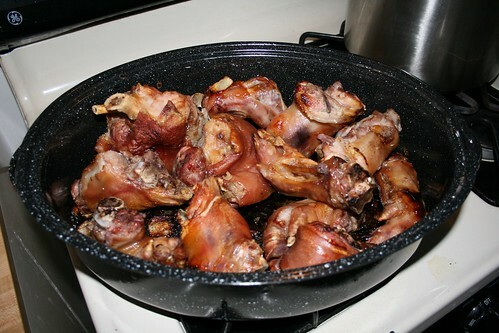 So this week, we made Lamb Shank Confit in Duck Fat. It's lamb cooked sous vide in duck fat. How delicious does that sound? Super delicious. Sure, neither of us had done a confit before. Sure, we don't have a "proper" immersion circulator. But hey, we can get around that stuff easy, right? Right? 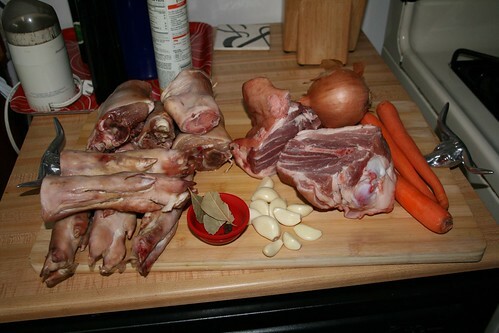 So here's our mis en place to get things started -- right before the lamb shanks went into the brine. 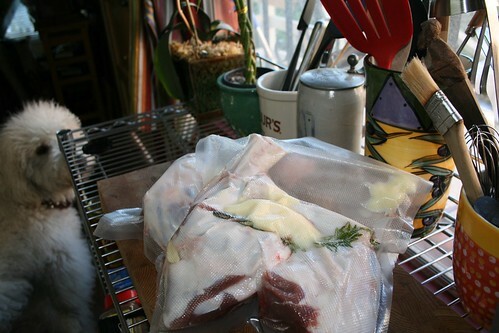 We got started by vacuum sealing the protein, fat, and aromatics. Note that while this is not a recommended use for Foodsaver bags, we didn't have any problems. So we'll do it again. And again! And again! Bwwaaah ha ha! 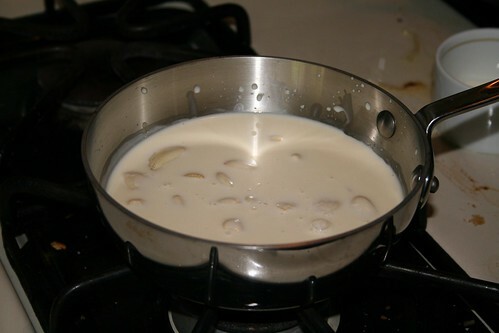 Here, we have the garlic creme sauce simmering away in our saucier. This is sauce one of three for this dish. 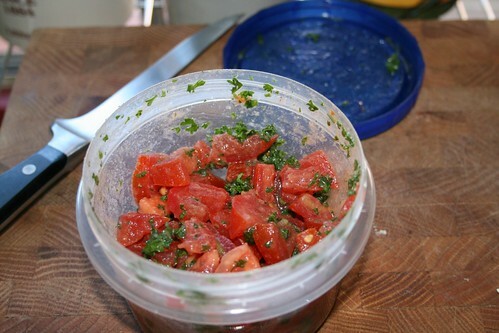 Now we sliced up some tomatoes and let them marinate for topping two of three. 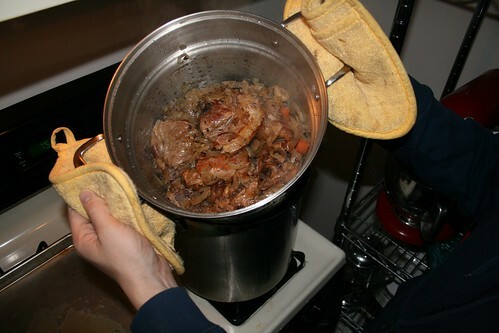 Several hours after getting dunked we retrieved the lamb-bags and separated the juices from the meat. We put the meat in the fridge and by now things are starting to smell gooooood. Then we strained the juices... which we then stuck in the freezer for a half hour or so to separate the duck/lamb fat from the jelly. 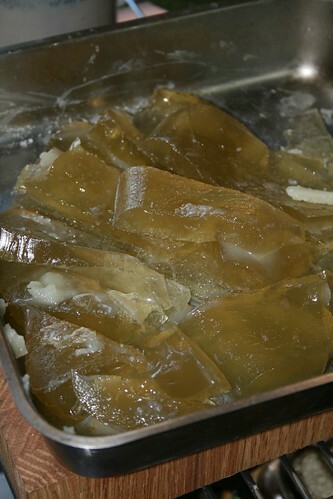 Then we spooned the fat from the top of the juice and are left with this: "lamb jelly." 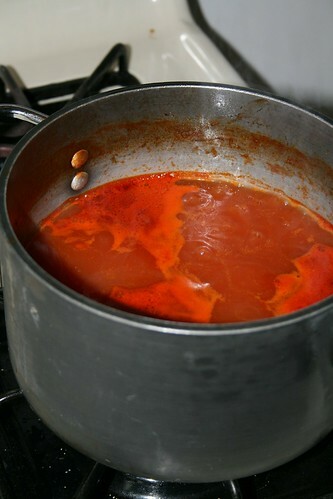 This will be a part of sauce number three of three. Speaking of sauce... remember that garlic sauce? 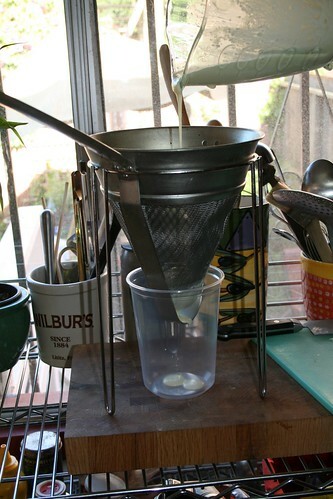 We've blended it now and are putting it through that heroic kitchen tool, the chinois. It smelled so delicious, it was all we could do to keep ourselves from sipping on it. Mmmm... garlic cream. 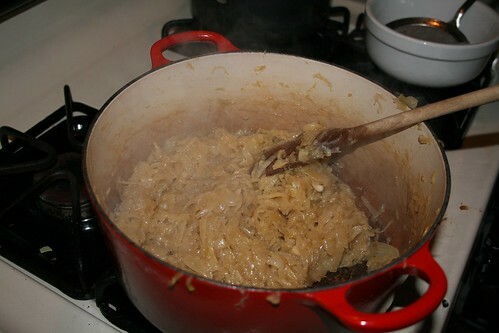 Now we took the lamb jelly, added to some tomato sauce and homemade lamb stock (thanks for the lamb neck, Avedano's! you guys rock! ), and set to reduce for a little bit. Look at that color! 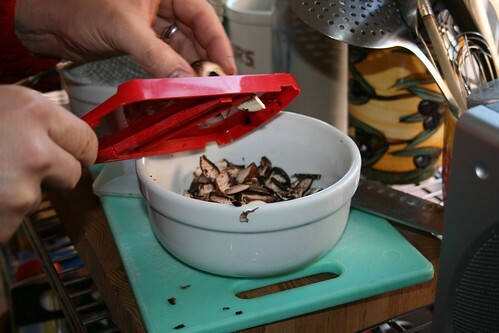 Moments later, mushrooms get thinly sliced through the mandolin (good results, but somewhat nerve racking for Jacob and his fingers). Shanks (split by the butcher for better access to the marrow) and sauce three of three in Big Copper and into the oven for a slight warmup. Here the action really started to rev up. We had put some lentils on heat, and when they were done, we drained them and put them atop the sliced onions and the mushrooms to heat things through. Then it got a vinaigrette tossed in. Then we started the hot plating action. 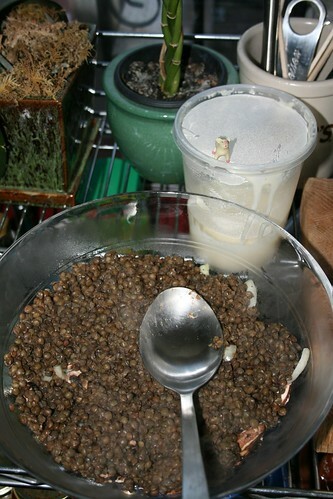 First, lentil salad! This turned out awesome. 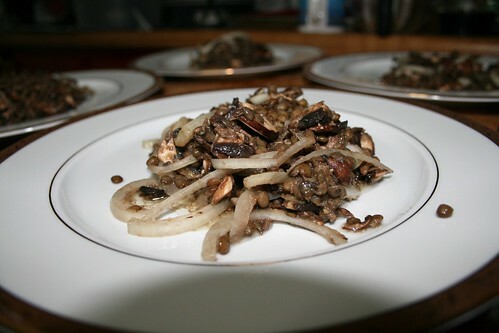 The just-softened mushrooms and onions played well with the lentils. The fresh diced tomato sauce worked well with the warmth of the rest of the dish. 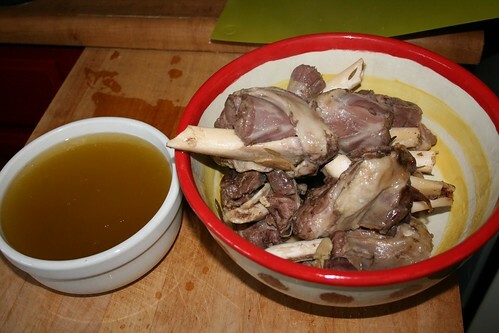 The vinaigrette cut the richness of the garlic cream, and most of all, the lamb was fall-off-the-bone tender. Our guests were thrilled and so were we! We thought it would be a heavier dish but we were pleasantly surprised - it wasn't so heavy after all - and the sauces were all really quite wonderful. Well worth the effort! Jacob was especially happy with the garlic sauce, though he didn't want to pick a favorite. Note to selves: Read carefully! 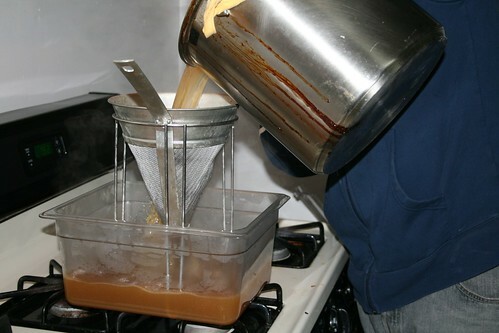 We very nearly missed that we were to chill the lamb juice (which allowed us to separate the fat from the jelly). This would have resulted in some very greasy sauce! Luckily we noticed the seemingly throwaway phrase ("set aside juice to cool") just in time. Schwoo! Time, mis to eat: About 24 hours, as there was some brining that we had to do the night before. Not counting that, about eight hours - six of those being the lamb sous viding. Cost of the components of the dish: $56 (excluding things we already had in the pantry). 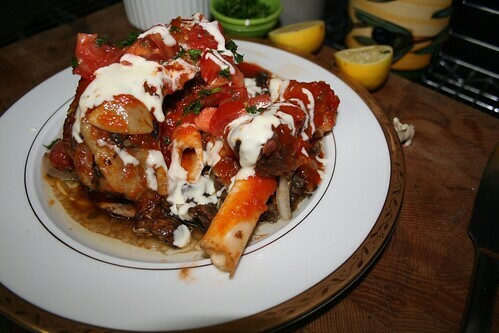 The majority of that was spent on the lamb shanks - we went with fancy free range goodness. Oh, and goodness it was! Blast from the past: Check out our new feature, "Out of Scope," where we took the dive into beef marrow. We've heard that bone marrow is God's gift to the serious eater. 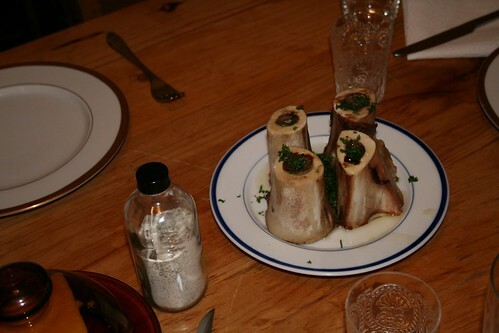 We've heard that bone marrow is, maybe, the apex of richness and decadence. 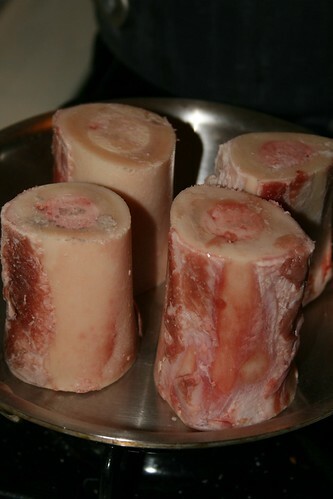 So when we saw some marrow bones at our friendly butcher, though not an official recipe of The Good Book, we thought we'd give it a try. They were cheap and good looking - a good combination - so we picked them up without much of an idea how to prepare them, much less consume them. But what the hell! Might as well! So we did. We did a fair amount of research in an effort to find the best way to prepare our four little troopers. Keller was consulted. eGullet was consulted. Fergus Henderson was consulted. Various other Printed Authorities were consulted. And in the end we decided that a simple roast in the 400 degree range would do the trick. So we stuck those suckers in there and hoped for the best. 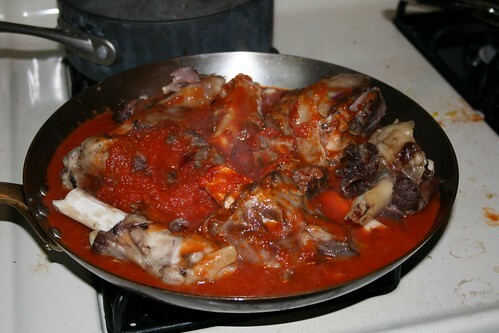 Then we passed the plate around, removed the marrow from the bone, spread it on some crusty bread, and there it was. And it was... rich. Like foie gras, but more so. It was pleasing, absolutely, and really very good, but none of us were sure that we could have more than the portion that was available to us (which we believe would be considered a half serving, traditionally). Undoubtedly this is a great food, one that really isn't like anything else, sort of like meat butter. And rich... so rich, as to be nearly overwhelming, such that we were at marrow-pacity when we finished eating it. After our main meal (lamb confit - which could be termed rich as well!) was done, and our guests had retired, we discussed the dish further and agreed that we weren't sure we'd go out of our way to try it again in the future. 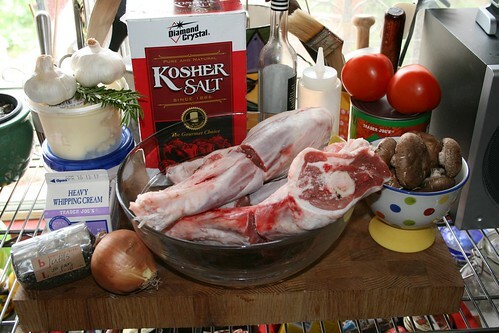 As the meat buzz wears off, we then reassessed our position and would like to try it professionally prepared some day. Certainly as the first offal we've prepared for direct consumption it was quite an experience, and one that we were pleased to share with friends. 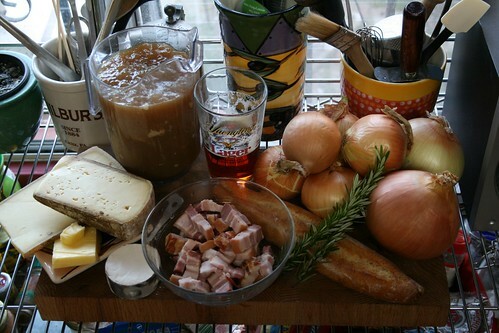 We came home at the same time last night, and after a quick jaunt to a new-to-us local butcher (more about them soon, I'm sure) we dove right into our first proper mission: PDC Onion Soup. First and formost: BEHOLD! The power of mis! Here's our ingredient depot, with everything ready for abuse. 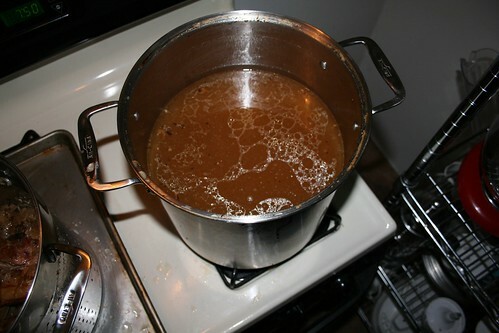 The brown stuff in the pitcher is the pork stock from a few nights ago: note the wonderfully gelatinous texture it has taken on. 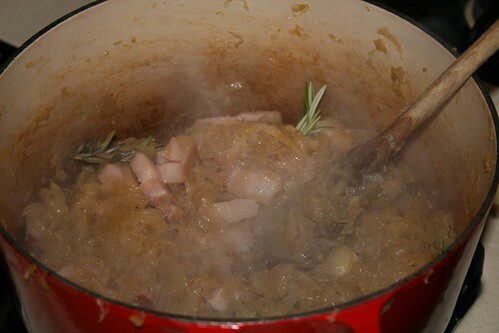 And after a little more time on heat it was time to add in the stock. 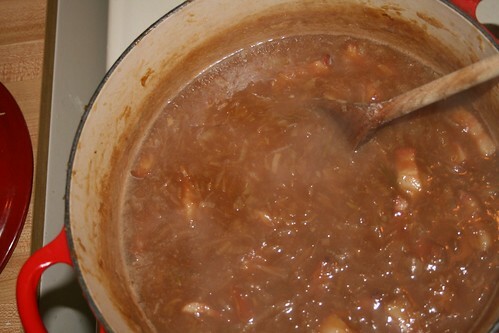 This was the fun part for both of us, where we got to have an idea of what our soup was going to look like. 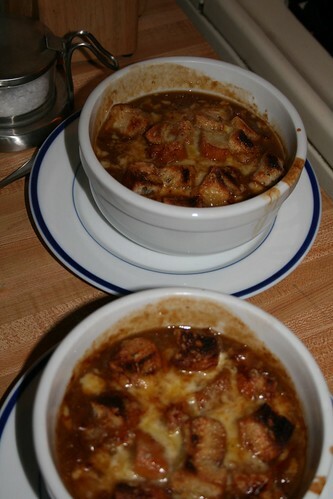 And like most french onion soups... it doesn't really photo well. But the smell coming up from the pot? Amazing. Pleasing. Super-moo-rific. As for the success of the dish, we liked it very much. 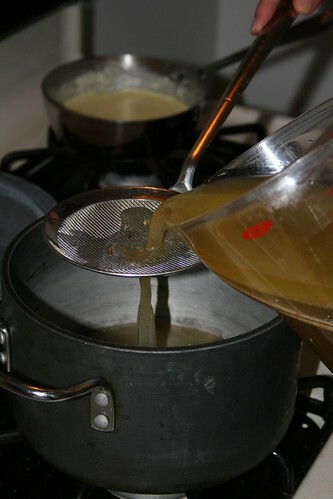 It was different from what we're used to - the broth was definitely improved tremendously by the use of the stock we made. The onions ended up being quite good and the addition of the lardons to the recipe added some interest that we both remarked positively upon. 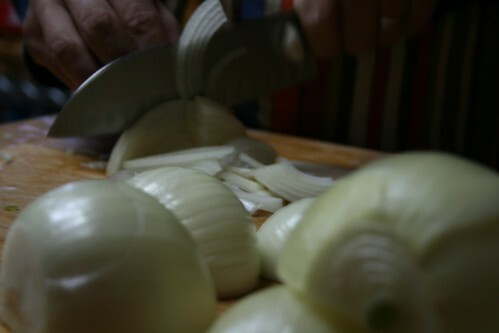 (Though next time, we'll probably cut them a little smaller and remember to remove the skin! Ooops... user error.) Using croûtons instead of slices of bread was a great addition. It made them bite sized and super manageable in the broth - especially for any family members with braces. We loved the cheese - it was subtle, coming through just enough, and really added to the rest of the flavors. We ended up adding a bunch of salt at the end of the process, as advised in the recipe, and found it a welcome boost to what was there. All told, a successful dish. Perhaps the best part of all was that we both had little balls of warmth and happiness in our bellies for about an hour or so after finishing the meal. 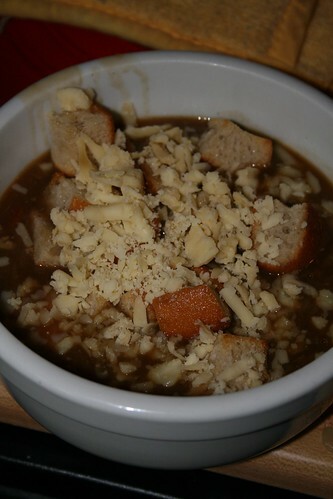 Mmm... onion soup. Note to selves: no more starting long recipes on weeknights! Cost of the components of the dish: $24 (excluding things we already had in the pantry), but um, at least half of that was cheese. We subbed a Tomme au Savoie for the Emmenthal cheese ... and would do it again in a heartbeat! "Go big or go home!" is a motto of our household, so we WENT BIG (on the cheese)! Melty and delicious. 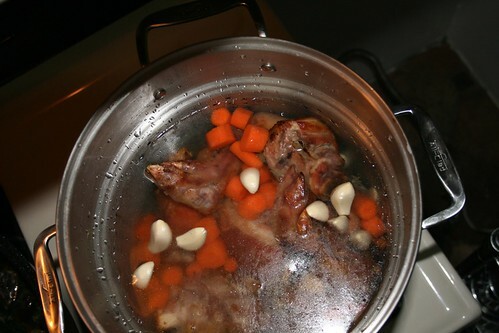 Blast from the past: Check out the super-delicious pork stock we made for this dish. We like pork. And we like it with a vengeance. Our collective pork pedigree includes curing our own bacon (Canadian and American! We are so multicultural), making pork sausage and air curing chorizo. (Thanks, Michael Ruhlman!) We've had a membership to the Bacon of the Month Club and own uni-taskers for pork related production like this and this. We've shared our pork love with friends with pork themed parties, like "Pink or Pork" (with prizes donated by the National Pork Board) and the annual JTR Ranch Pig Roast. All of our pork adventures have been awesome learning experiences. Some recipes had great success, some not-so-much. (Not recommended: Guinness & dark chocolate bacon, so many great tastes, not so great together.) But let's face it, Everyone Loves Bacon. It's time to take our pig love to the next level. The Pied. Where to start? What to cook? As founding members of TEAM Excess and longtime readers of the cookbook-at-home stylin's of Carol and her French Laundry Rock Starness, naturally, we decided to do it all. Because it's fun. And we'll get to get our learn on. And it's a great excuse to share good food with good friends. And c'mon, there's pork and foie gras involved. What other reason do you need? None, thankyouverymuch. Come, let's celebrate the pig!